Center can offer every family. of Tampa's Jewish day school. vide to our students," Laurie said. reunion during the open house. to dedicate our new facility. Center at 3919 Moran Road, Nov.
also in many private colW .as. of which she is a past President. the Haifa Museum of Ancient Art. Major Gifts event. Myer "Mickey"
New President. We were delighted to learn that Leonard H.
1986-87 at the Tampa Museum of Art. His term began Oct. 1. Trustees serving with him include Trudy Barkin, Joe Abrahams. senior at Plant High School. Council of St. Mary's Episcopal Day School. and one in the senior high divisions. Mazol tov to you all! facility a reality, special thanks go to chairman Barry Karpav. Jack Roth, Leah Davidson, Sandy Solomon, Mark Rosenthal. Deutch, Teresa Oncher and Eileen Waltuch. make new friends; you can get in touch with them at 968-6374.
dian, 2808 Horatio St., Tampa, FL 33609.
iMfc J THI OfJGINAL WOODEN GYM ? mittee and the Board of Directors. they have a suite stay. How Much Can Yoa Deduct? costs can be reduced even more. tical purposes, you keep it for life. followed by a discussion by Dr.
Know About the New Tax Law. RSVP by Dec. 10 to 875-1618. POTATO KNISH $0.95 M $0.80..
TW Javiah Flarlaaaa Oaaa Nat Gaanataa TW fc.Un.lt. Postmaster Send address changes to The Jewish Floridian. 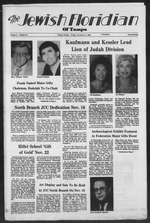 Editor's Note: Rabbi Kenneth R.
Sholom on the eve of Yarn Kippur. past nit it's unbecoming of us. we have nurtured a new breed. planation fell on deaf ears. that is a sign of your being Jewish. around the rabbi for an interview. Zedek for those killed in Istanbul. puzzling look, but remained silent. Jewish charity. That bothers me. ing to buy our way in or appease? for our children, for all Israel. seat, you are standing in the back. more delay, do it hayom. the Holiday Season, Without all the Tumult in Your Kitchen. decoration to make your simcha uniqua and unforgettable. YES! WE ARE OPENING ... on or about November 18. We will still have the best smoked fish A salads. Wa will still hava tha bast dall maats. Wa will still hava tha bast homa cooked foods. YOU WILL STILL HAVE BILL A JOE TO SERVE YOU. Wa ara adding a dining araa with a full menu. Wa ara adding breakfast on Saturday A Sunday. Wa ara adding a full Una kltchan. Turkeys to a complete meal. a.m.10 p.m. Sat. 8 a.m.-10 p.m. Sun. 8 a.m.-9 p.m.
COME JOB* m THE FUN! will be a 9 a.m.-5 p.m. program. movie without a full day program. must be in no later than Dec. 8.
may be set up at an extra fee. hurry to reserve your date. members $5 per child plus $20. oui and 6th graders Club "456"
- is a cool co-ed club to join. uiterest and work on projects. and Jan. 8 at the Main Branch. dates: Dec. 2, Jan. 13, March 3. Teen Conference is held Jan. 25. To be held Feb. 5 through the 9th. this one. Mark those calendars! within children Tween and Teen. begns Sunday, Dec. 7, 1-2:80 p.m.
basketball League will start Jan.
)icked up at the P.E. office. NEW Yoga Adult, 7-8 p.m.
9 a.m.-l p.m., and 816 Madison St.
ly, folded neatly in grocery bags. Meet at North End Site. dsy of the month 10:30 a.m.-noon. $2 per month for non-members. NOV. 20 INFO. CALL 021-7061. ... or a Color TV. the Chassidic Festival, Dec 18.
office if yea can help as. NOVEMBER 16, 1 P.M.-4 P.M. Branch Celebration. Rates for Nov. 16 ONLY! Behrman, etc. For infant to adult interest. your counselors and get that Ruach! Yeh, Man! FIRST TWEEN DANCE at the North Branch with D.J. Howard Allan, 7. p.m.-9 p.m. Be There! its ancient buildings and artifacts. and Jan. 1 in the Holy Land (Dec.
Judaism and Islam, including dec.
jiyoshida, at the base of Mt. Fuji. fencing, swimming and the spa. week cost is approximately $900. Jerry Van Durmen at 974-3218.
beings" in one area of tile gallery. ms on Thursday, Dec. 4.
waters lapping at her front door. do with writing is sacred." Judaic lore, are bathed in warmth. years ago affect us today." generation and those to come. ty, justice and civilization itself. place in life's eternal struggle. life in a better world. Westshore Marriott on Sept 21. Rated among Tampa's Top 10 in Casual Dining. said he could do better. and parents, knew he could. Kor a while Tommy managed to get by. math, and go on to fulfill UVir potential. better, let Sylvan show him how. ner," Tuesday, Nov. 18, 6-7 p.m.
also be offering a "take-out"
other supplies used at the Mt. dark spots on my skin? and Dorothy Skop at 839-0167. Please call by Monday, Nov. 17.
day evening, Nov. 19 at 8 p.m.
8 p.m. Hillel School Parents' Association "Gift of Gold"
Saturday, 9 am. Daily morning and evening minyan, 7:80 am., 6:46 p.m.
Friday, 8 p.m.; Saturday. 9:30 am. Hauben Services: Friday, 8 p.m.; Saturday, 10 am. Daily: Minyan, 7:16. Farber. Services: Friday, 8 p.m.; Saturday, 9:80 am. evening 7 p.m.; Saturday morning 9:80 am. P.O. Box 271167. Rabbi Yomie Dubrowski, Executive Director. 963-2817.
evening 7 p.m. Sunday Bagel Brunches, 11:80 am. study discusson ssesioos, "Shabbat Experience," monthly services and dinner. Jay Justin Older, m jx, fa.cs. uncles Norrna and Ike Maybruck Washington. D.C.
Florence Stesis, Mr. and Mrs.
as a Bat Mitzvah of Friday, Nov.
14 at 8 p.m. and Saturday, Nov.
the Spirit and Drama Clubs. Mrs. Gene Balis, Dr. and Mrs.
Stuart Goldsmith, Mr. and Mrs.
Joan Glazer Farber will officiate. awarding of many prizes, and fun for everyone. bat, coordinated by Mr. and Mrs.
of Sydney for out-of-town guests. ward I. Cutler, of Tampa; Mrs.
Apollo Beach 10 year* ago from Baltimore. nice Kalliah of New York. area for one year, moving from New York. He was a clerk with the U.S. Post Office. Island Hotel will be hosted by Dr.
home for out of town guests. give their blood when called upon. of Jewish history for two millenia. new heart of the Jewish people." tional co-chairman of Telem is directly to the Ambassador's left. are pledged to Zionist self-fulfillment through Aliyah to Israel. together a good loan package. 315; or Tampa, (813) 974-4274.